Last night was the fourth official meeting of the 2013 Moxie Festival Committee and I’m glad I’ve been able to attend all four. Being part of clubs, committees, and organizations is an important staple of small town life because the only way you can really get to know people is to, well, get to know them. It takes more than one face to face interaction or a few e-mails. An important agenda item we covered during our meeting was an update on the parade. It takes a special person to coordinate a parade; one of my father’s old friends from high school, Noyes Lawrence, coordinated it in the early days of the festival. He said the best way to describe success is if it’s a “two stogie parade.” This year, Gina Mason is once again coordinating the parade and she’s got some interesting and entertaining leads developing. I can’t even imagine which side of the brain is required to logistically and neatly organize all the details of the biggest parade in the state of Maine; I’m glad Gina’s got that kind of brain. We marched in a parade together once, with batons. I do not have a baton or a parade brain, as evidenced by my attempt to get Bill Lee as the grand marshal. One of the categories of parade entries that are always welcome are “floats.” This category covers more ground than one might think and can range from something as simple as a decorated baby buggy to an elaborate creation on the back of a large flatbed truck. Over the years, I’ve fantasized about the type of float I would make if I just had a little bit more time. I’ve even talked out some of my ideas with Faye, who has won awards for the floats she’s built. 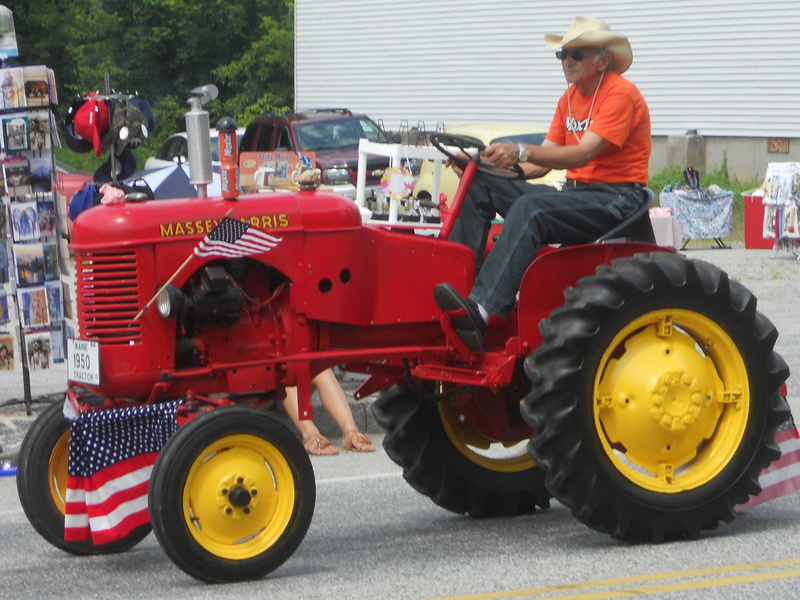 It’s not complicated; a person could dress up their tractor and make a float. I don’t think this will be my year to make a float for the Moxie Parade, but I’m sure there are one or two people reading this blog right now who will comment and describe a never-been-tried float idea. This entry was posted in Home, You've Got Moxie! and tagged 2013 Moxie Festival, baton, Bill Lee, majorettes, Moxie Parade, Parade floats, parades. Bookmark the permalink. Julie-Ann, I still have a baton and an extra for you, if you would like. We could do a throw back tour and include fellow Moxie Committee member, Brenda Rogers, who was also a baton twirler back in the day. Excited for Moxie and the great group we have this year! Oh, and ready your stogies hopefully we can pull off a big parade this year. Thanks for your involvement in Moxie, you are a much needed addition. Aw, shucks…I’m wiping a little tear from the corner of my eye right now. The majorette routine will have to be next year, though, Gina. Thanks for stopping by!